As I’ve said before, I absolutely love Molton Brown. Their products are hard to beat, and whenever I use their bath goodies, I feel like I’m in some swanky hotel. This month, the brand are releasing a new fragrance range: Honeysuckle & White Tea which is just heavenly. The Bath and Shower Gel is a perfect choice if you want to treat your mother on Sunday. The bottle itself is so pretty, with a lovely purple flower twisting around it. Once you get inside though, it feels magical to use. 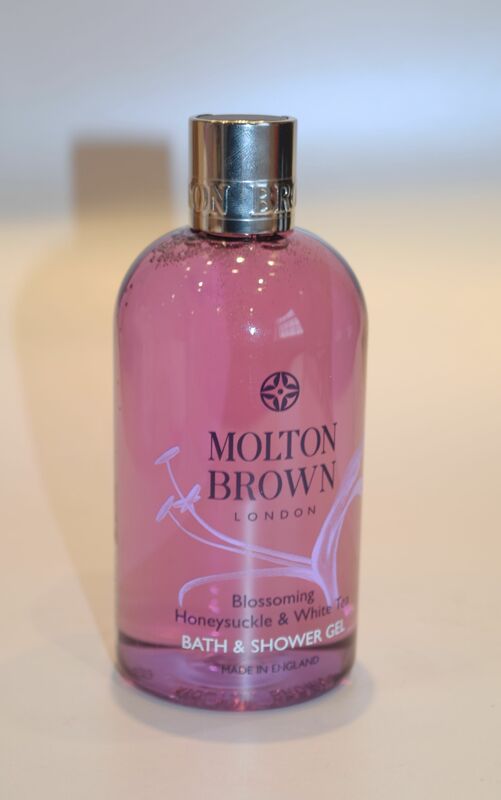 Like all Molton Brown Bath and Shower Gel, the texture is wonderfully thick, meaning that baths are filled with mountains of bubbles, and it turns morning showers into the best possible way to start the day. I just love the new scent, the notes of honeysuckle give it freshness, whilst the white tea is an unusual base note. It’s a very calming fragrance, and it would be the perfect little luxury to gift on Sunday!